A golden age for the neutrino is dawning. A few decades ago, these shy phantoms that flit nearly unfelt through the interstices of the universe seemed mere leftovers in the world of physics. They outnumber all other particles of matter, whizzing away everywhere — many of them arising in droves from nuclear reactors and nucleosynthesis in stars. Their characteristics made them, to be sure, vitally important building blocks in the 1970s and ’80s for theorists who put together the standard model of physics, describing how fundamental forces and particles fit together. Yet, for decades, neutrinos seemed nearly incapable of doing a lick of work. They were like clowns pouring from a circus car, entertainment for theorists but without important jobs in keeping the cosmos running smoothly. It is about time for the neutrino to add gravitas. “When I first learned about it in the early 1950s, the neutrino had an odd role in nuclear physics, like that of a sort of crazy uncle who was not all there,” physicist and science writer Jeremy Bernstein wrote in an essay in the March-April 2012 issue of American Scientist. While neutrinos have been rising in mystery and thus stature for some time, their most recent big break occurred last March. It stemmed from measurements made deep inside a granite mountain not far from Hong Kong. There, an international collaboration — led by an American contingent from the Lawrence Berkeley National Laboratory in California and scientists at the Institute of High Energy Physics in Beijing — has in the last six years built some of the world’s best underground detectors for neutrinos of the specific sort generated inside nuclear reactors. The instruments sit under tens to hundreds of meters of rock to shield them from particles that would swamp the faint signals. Access is via tunnels near a tightly clustered set of three nuclear power stations along Daya Bay, each with two reactors. Together, the six reactors spew antineutrinos, the antimatter versions of neutrinos, at a rate of more than 3 billion trillion per second. After months of sampling this subatomic flood, the collaboration (with 270 or so authors from dozens of research centers around the world) reported a far more accurate measurement of an obscure-sounding factor called a “mixing angle.” Specifically, it is theta one-three or, in its mathematical representation, θ13. It is one of three neutrino mixing angles, and the only one that had eluded anything but fuzzy estimation. Together the mixing angles govern key aspects of an astonishingly shifty behavior that neutrinos possess. As for the theta one-three result, it will take at least another decade or two of experimentation with a new generation of equipment for the full payoff. But there is the possibility for plenty of excitement. The measurement raises hope that future tests will find, in neutrino physics, an answer to an enduring cosmic puzzle: Why is the universe dominated by matter, not antimatter? It now seems possible, in fact, that without neutrinos the universe may have lost nearly all its ordinary matter almost as soon as it was born — leaving a sea of radiation thinning and cooling forever. Confused? Hang on. Understanding the significance of the Daya Bay results requires a quick review of neutrino history. Famed physicist Wolfgang Pauli dreamed these particles up in 1930, in a letter to a few colleagues addressed “Dear Radioactive Ladies and Gentlemen.” The cloud chambers and other detectors of the day revealed a puzzling and variable shortage of energy in a process known as beta decay. It was first observed when atomic nuclei emit an electron. Pauli suggested that an undetected particle carried the missing energy off. The particle would have no charge and, scientists suspected, no mass. It took 26 more years just to confirm the existence of the energy smuggler. Hard to see, indeed. Rare, no. Tens of trillions of neutrinos pass through every person on Earth every second. The type proposed by Pauli, associated with electrons, is now called the electron neutrino. Since its discovery, two more “flavors” have been confirmed: tau neutrinos and muon neutrinos, which are associated with two unstable partner particles that, like electrons, belong to the lepton family of elementary particles. Each neutrino flavor, as with other elementary particles, comes in an antimatter version, too. Recent rumblings have some theorists thinking about the possibility of a fourth neutrino, so incapable of coupling with other particles that it is called the sterile neutrino. 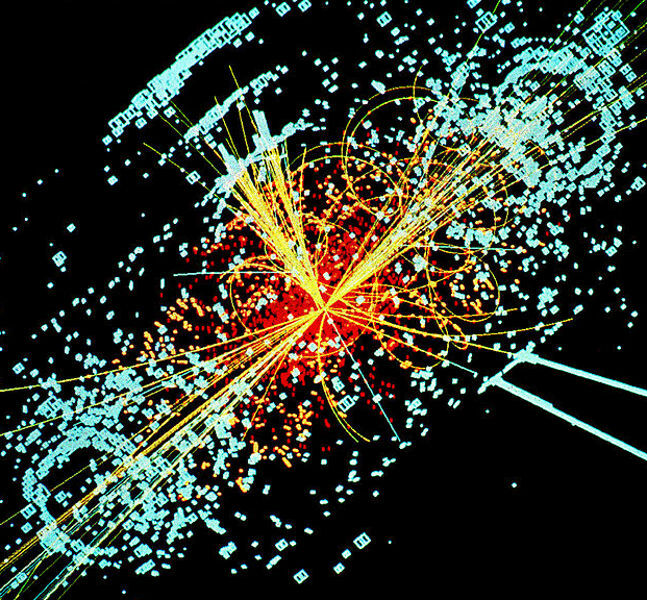 Such a particle would point to physics beyond the standard model, but for now remains a big question mark. Physicists have also been surprised by overwhelming evidence in the last 10 to 20 years that neutrinos have a smidgen of mass. The exact heft for each flavor is keenly sought, but none is large. Efforts thus far reveal that the neutrinos have different masses, and that one is markedly distinct from the other two, but no one knows which one it is. Whatever the masses, each appears to be less than a fraction of a millionth that of the electron and under a billionth that of the proton. Nothing with mass can travel at the speed of light. But featherweight neutrinos come close. A neutrino with the typical oomph of those made in nuclear reactors would have a velocity that differs from the speed of light by only one part in 1020, says Zoltan Ligeti, a theoretical physicist at Lawrence Berkeley National Lab. “A light-year is 1016 meters. So a neutrino traveling a light-year would be 0.1 millimeters behind a photon” on the same trek in a vacuum, he concluded. Other than through their tiny gravitational pull, neutrinos react with other matter only via the second-feeblest force in nature — called, for good reason, the weak interaction. Once in a long while, a neutrino may hit a quark inside a proton or similar particle just right and trigger a spray of debris of other particles. But neutrinos may also go through light-years of solid lead without leaving a trace. Many that were spawned in the Big Bang still zoom on today. Detecting them continues to be maddeningly difficult, which is why instruments are usually buried deep in ice caps, under the sea, far underground — or inside mountains. Finally, most peculiarly and most at the heart of the matter, neutrinos are geniuses of disguise. Each variety has in its nature a tincture of the other kinds of neutrino. An electron neutrino may masquerade as a muon neutrino for a while, then revert. In the 1960s, many physicists feared the sun’s thermo-nuclear fires were ebbing — a serious matter for Earth’s habitability. Two-thirds of the expected neutrinos could not be detected. Eventually, physicists concluded that electron neutrinos were changing into tau and muon garb, equivalent to invisibility cloaks to which the original detector was blind. Physicists refer to this identity-switching as oscillation. It is not unknown among fundamental particles; quarks and particles called kaons do it too. Only particles with mass, if only a bit, can oscillate this way. For years since the discovery, work at labs around the world has accumulated data on how and when neutrinos oscillate. The hope: to understand the full nature of these unruly characters. Daya Bay’s six detectors in three halls spent 55 days in late 2011 and early 2012 counting antineutrinos. An array of photomultiplier tubes, essentially light meters, surrounded six transparent, acrylic-walled chambers filled with an organic fluid scintillator that fluoresces when struck by particles. The light meters recorded flashes as the antineutrinos scored the occasional hit. The daily harvest was about 70 neutrinos, out of the uncounted zillions that flew through without detection. But more crucial, the far detectors, 1,500 meters or so from the line of reactors, saw about 6 percent fewer electron antineutrinos than might be expected given the measurements from the closer detectors. The deficit measured at this distance fits with a theta one-three mixing angle of about 8.8 degrees. This measure is not a physical angle but appears in the plots of equations that physicists use to assess how packets of quantum mechanical waves slosh about in abstract spaces, pushing the probabilities up and down that a neutrino will be caught as one flavor or another. Not only that, it is larger than had been expected, which means that key behaviors of neutrinos should now be easier to sift out. “This is an important result because for the first time we have determined with certainty that the mixing angle theta one-three is not zero. We had indications but nothing, until now, that told us conclusively,” says Kam-Biu Luk, another Berkeley physicist and Edwards’ codirector for the U.S. side of the Daya Bay experiment. A zero would be bad news, wreaking havoc in key equations and making the full suite of neutrino behavior much harder to observe. With rough values of all three mixing angles now in hand, science takes a key step toward learning what happened in the first few moments after the Big Bang more than 13 billion years ago that left the universe dominated by matter rather than antimatter. Had the two kinds been neatly balanced they may, in a short time, have annihilated one another. That means no stars, no planets, nobody. The Daya Bay result, and neutrinos’ ascendancy more generally, is historic for another reason — national pride. It marks a new stature for China in elite, basic science. In fact, it is payoff for a host of Asian nations investing heavily in neutrino science and joining Europe, North America and Japan in the front row. A report in Science on the announcement declared that the measurement “puts Chinese particle physics on the map.” Many other physicists agree, but China’s project officials don’t brag out loud to that extent. Yifang Wang, director of the Institute for High Energy Physics in Beijing and overseer of the 150 Chinese physicists and engineers working on it, says that the experiment is important but China’s rise is too big a concept to be achieved by just one result. Last April, close on the heels of Daya Bay, the Korean-based Reactor Experiment for Neutrino Oscillation, or RENO, reported much the same result from tests near a six-reactor complex of its own. Japan too might have been in the running, but the neutrino source for its famed Super-Kamiokande detector had to be shut down for repairs after the 2011 earthquake devastated the nation’s northeast. Within five years another Asian nation expects to join those with front-rank facilities: The $300 million India-based Neutrino Observatory, or INO, is about to start tunneling into a mountain near that nation’s southern tip, creating India’s signature facility in basic physics. 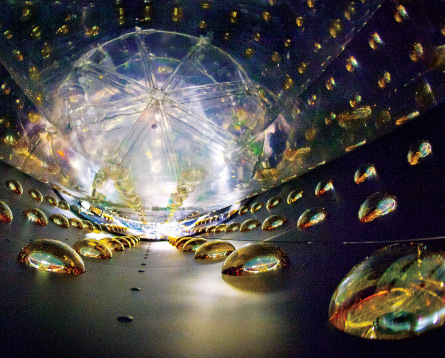 For neutrino hunters around the world, the Daya Bay results are a bright green light to step up the chase. The road is open for a long list of experiments needed to further define the behavior of neutrinos on the rare occasion that they manage to interact with matter. After that will come experiments to compare matter interactions with antimatter ones. If there is a difference, it will bolster a key role for another related but distinct family of exotic, very massive neutrinos that some theorists believe were in the stew of dense, hot radiation and particles present during the first few trillionths of the second after the Big Bang. Such conditions are impossible to re-create in any conceivable machine. But theory says such super-neutrinos could have, briefly, interacted vigorously and as equals with the quark stew or budding protons around them. If today’s family of neutrinos discriminates against antimatter, it stands to reason that the heavyweights of the ultimate yore may have done the same. Neutrinos may have been a little like flawed magicians’ hats that do a slightly better job of turning white rabbits into brown rabbits than the other way around. After a few hundred rounds of presto-shazam, brown rabbits would vastly outnumber white ones. Ditto for matter over antimatter. It wouldn’t have been magic, but physics. And because matter and antimatter mutually annihilate, plenty of matter would have been left when the dust settled. That’s the hypothesis. Whether a facility in the United States or Europe, or one in Asia, actually gets to testing it first is hard to guess. In the near term, efforts in the United States are likely to maintain vigor at Fermi-lab, filling the gap left by the shutdown of the huge Tevatron particle collider that for decades gave the lab its public face Workers are upgrading neutrino-generating equipment in the lab’s main injector storage ring — originally built to feed protons and antiprotons into the Tevatron and a major accelerator by itself. “We call it a superbeam, a muon neutrino superbeam,” says Steve Brice, head of neutrino experiments at Fermilab. The beam aims toward detection facilities more than 700 kilometers to the northwest. One detector is at an existing complex, the MINOS or Main Injector Neutrino Oscillation Search, in the deep Soudan mine in northern Minnesota. It has spent years measuring the disappearance rate of Fermilab’s muon neutrinos. Under construction about 80 kilometers away, near Ash River, is a mammoth new detector for the Noνa experiment (pronounced Nova, even though the letter “v” is written as a Greek nu, or ν, physics shorthand for neutrino). It is to have a mineral oil–filled 14,000-metric-ton detector touted as the biggest plastic structure ever built (about 15 meters high and wide and just under 70 meters long). The detector will be sensitive to electron neutrinos, the flavor into which Fermilab’s muon neutrinos presumably oscillate. From this should come refined measurement of the mixing angle theta one-three. Eventually, the Long-Baseline Neutrino Experiment will sample Fermilab’s neutrino beam from even farther out, more than 1,200 kilometers away at South Dakota’s underground Homestake Mine neutrino facility. With the right targets, it may be able to test whether the neutrinos in the beam interact differently with matter and antimatter. U.S. budget pressures have already nearly axed Fermilab’s Long-Baseline experiment — saved after a desperate appeal by its leaders — and may do so still as further fiscal cycles put on the squeeze. Some think Asia’s big programs are front-runners. “My bet is the Japanese will be the first to build a neutrino factory that can do the job,” says Nobelist and Boston University physicist Sheldon Lee Glashow. And India’s new observatory, says its leader Naba K. Mondal of the Tata Institute of Fundamental Research in Mumbai, will be at about the right distance to detect neutrinos shot from either Japan or Europe and to spot any preference for matter over antimatter. Whoever succeeds, the case may build for primordial, massive neutrinos as the agents that culled antimatter from the early universe. Quite a change in neutrino respectability from the days when their contemporary, lightweight kin were dismissed as the crazy uncles of physics. Even crazy uncles may have interesting family lore to share. Eight decades on, scientists are still struggling to understand the nuances of neutrino behavior. 1930 Wolfgang Pauli proposes a new neutral particle to explain missing energy in beta decay. 1933 Enrico Fermi incorporates the “neutrino” into beta decay equations. 1956 Clyde Cowan and Frederick Reines report the first experimental evidence for neutrinos. A later image (above) shows an invisible neutrino striking a proton to create three straight tracks in a hydrogen bubble chamber. 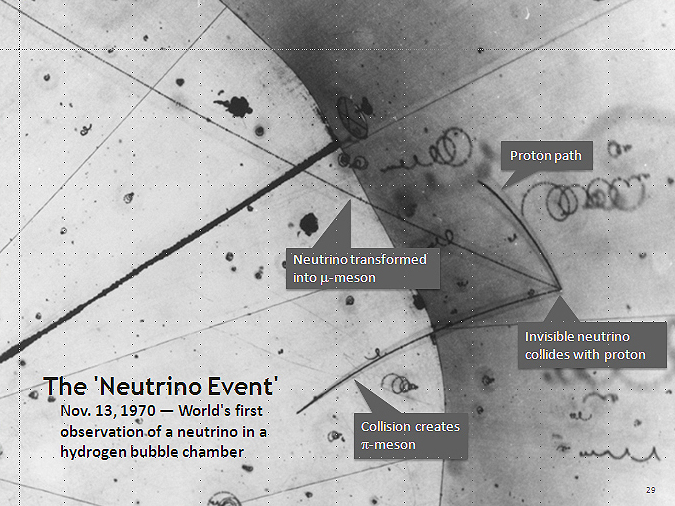 1957 Italian physicist Bruno Pontecorvo formulates a theory of neutrino oscillations. 1962 Experimental tests show that at least two types of neutrino exist. 1968 Neutrinos are detected coming from the sun, but there are far fewer than theories predict. 1975 A new lepton, tau, is discovered, suggesting a third neutrino flavor. It is observed much later. 1998 Super-Kamiokande experiment offers strong evidence that neutrinos oscillate (and have mass). Oscillations later resolve the solar neutrino problem. 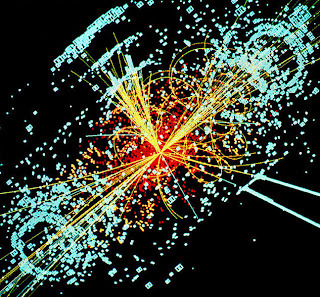 2012 Daya Bay’s theta one-three result suggests future tests may shed light on the matter-antimatter puzzle. and a all round thrilling blog (I also love the theme/design), I don't have time to look over it all at the moment but I have bookmarked it and also included your RSS feeds, so when I have time I will be back to read much more, Please do keep up the superb work.